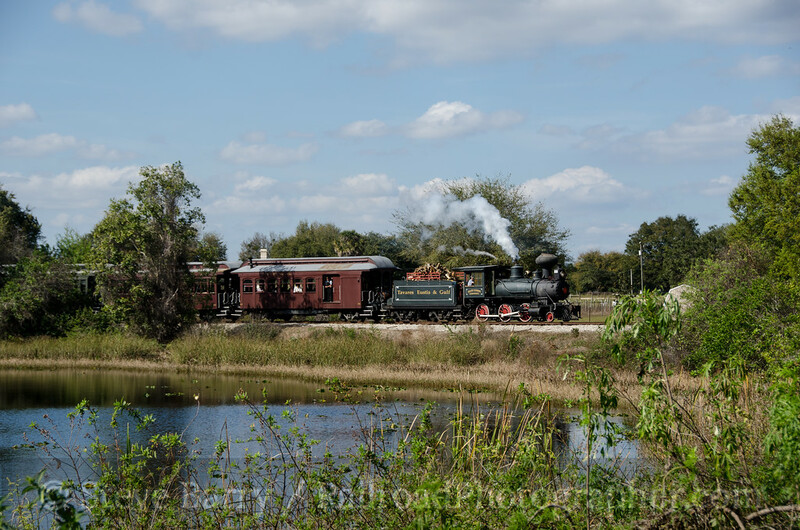 This is part three of a mini-series on Florida from a trip in February 2013. 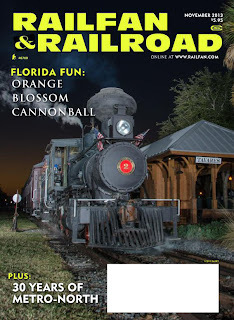 In the first part we visited the Orange Blossom Cannonball steam operation and in the second we visited the last sugar cane railroad in the U.S. and the South Central Florida Express. 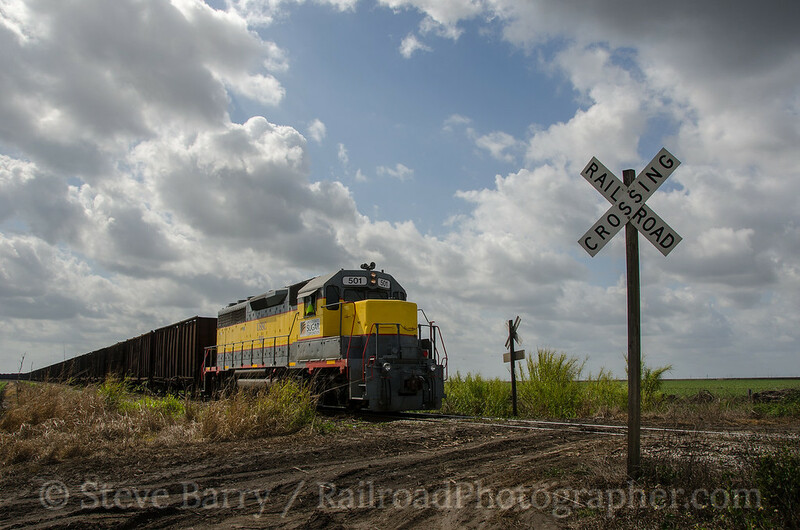 There is no railroad quite like the Florida East Coast. As its name implies, it follows the Atlantic coastline from Jacksonville to Miami. 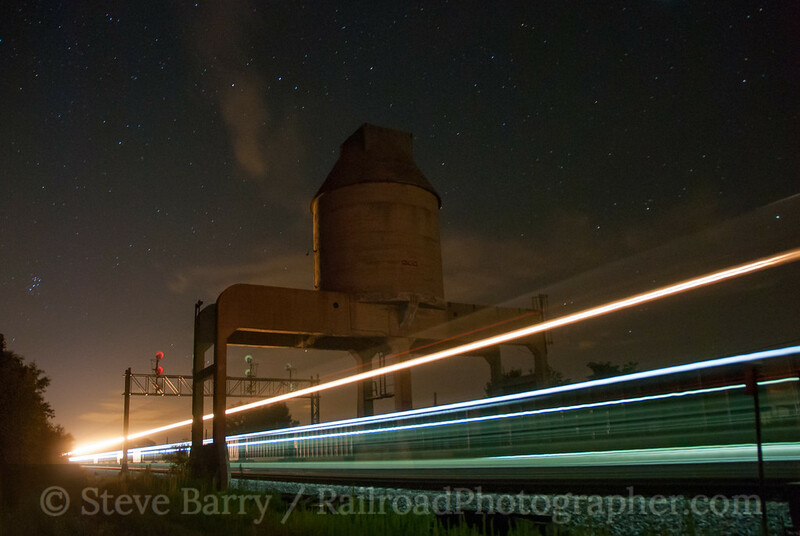 The railroad is a challenging one to photograph, as it is largely a nighttime railroad. Trains leave both ends of the line just after dark and arrive at the other end right around dawn. There are a couple of predictable daytime trains, including Train 101 from Jacksonville in the early afternoon and Train 202 from Miami. 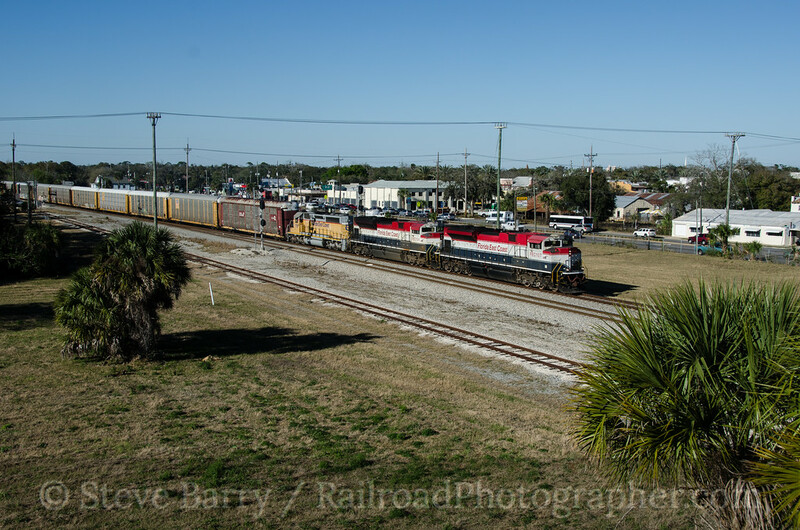 Our first train we caught on the FEC on this trip was 101 as it headed through New Smyrna Beach (above). One good thing about the FEC is the whole railroad can be monitored using ATCS Monitor, which allows you to see a dispatcher-style display of where trains are at any given time. You can tell when you have an hour or more to do something else between trains, and you know when you need to be near the tracks. 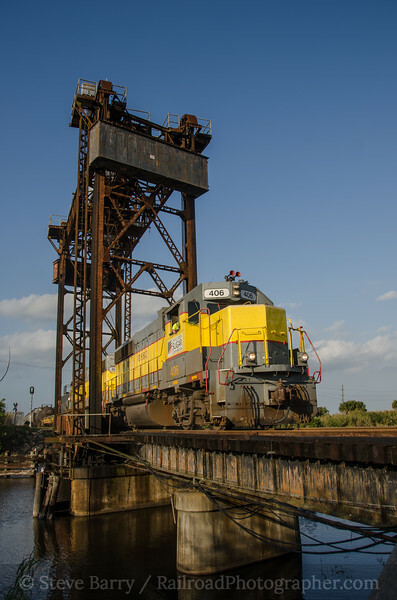 A location like Stuart is perfect, as there are ample restaurants and other distractions to occupy your time between trains. 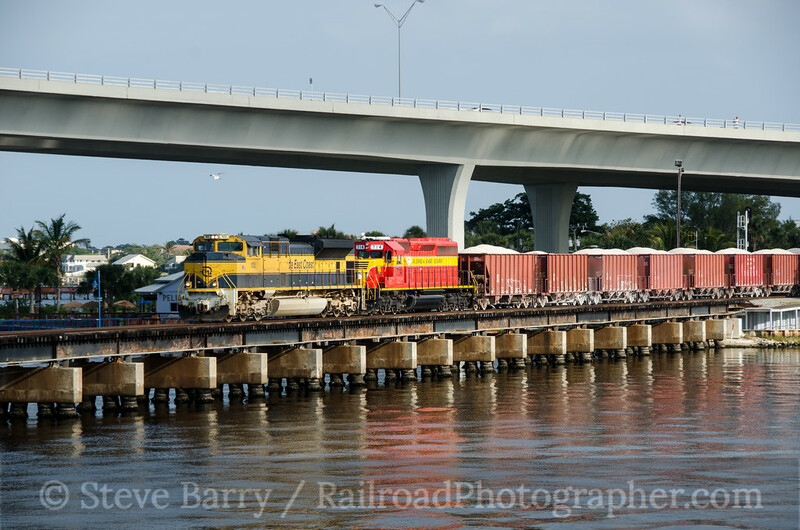 But come train time there are also ample photo angles around the big bridge over the St. Lucie River. The FEC is painting some locomotives into an early "heritage" scheme to add variety. 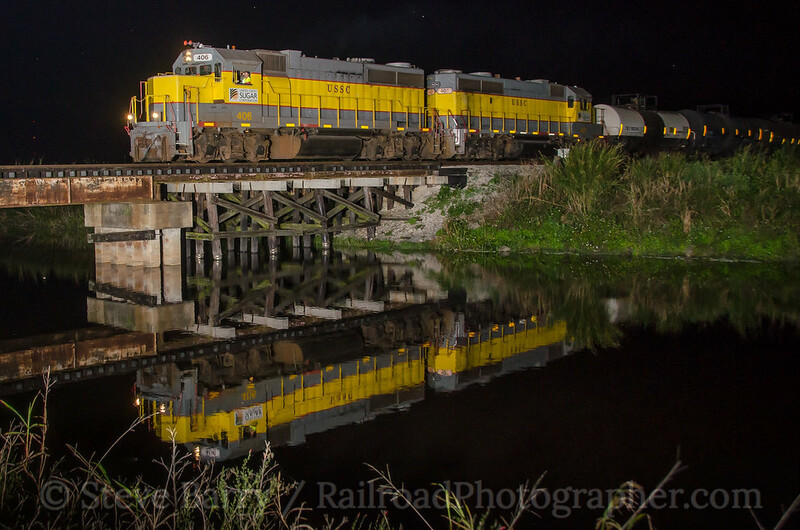 With the FEC being a nighttime railroad, the best way to keep the fun going is to keep shooting after dark. This was the first time I had brought my Alien Bees flash units to the sunshine state, and they came in handy. 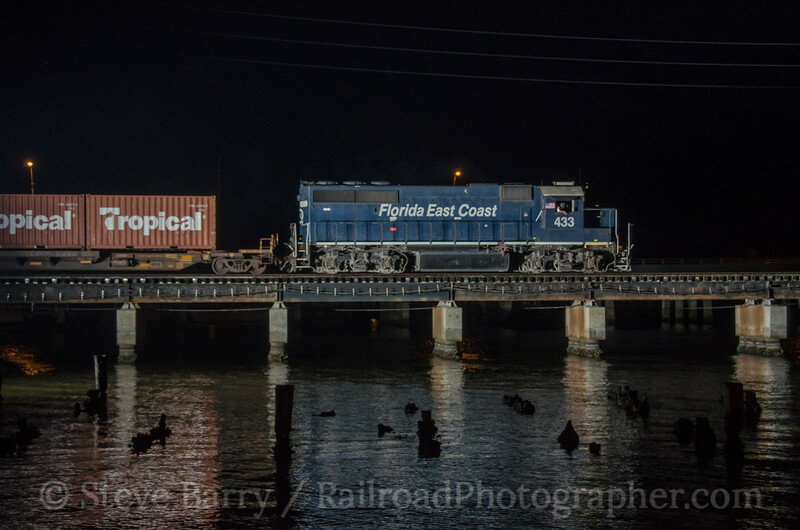 We set up on the dock in Stuart to shoot a local train heading north. Using ATCS Monitor, we knew there was plenty of time between trains to enjoy dinner and a beverage at the restaurant adjacent to the bridge, and finished in plenty of time to get reset for a southbound road freight later in the evening. All good things must end, and our time in Florida came to a close a day later. 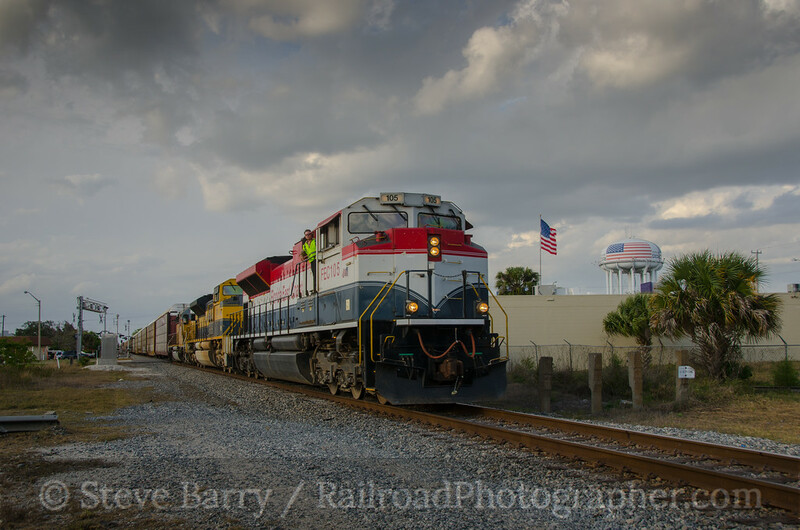 We headed north, and using ATCS Monitor we were able to intercept Train 101 as it headed out through Cocoa Beach. The engineer is a well-known train enthusiast, and he stepped out to wave to us as the train sped south. 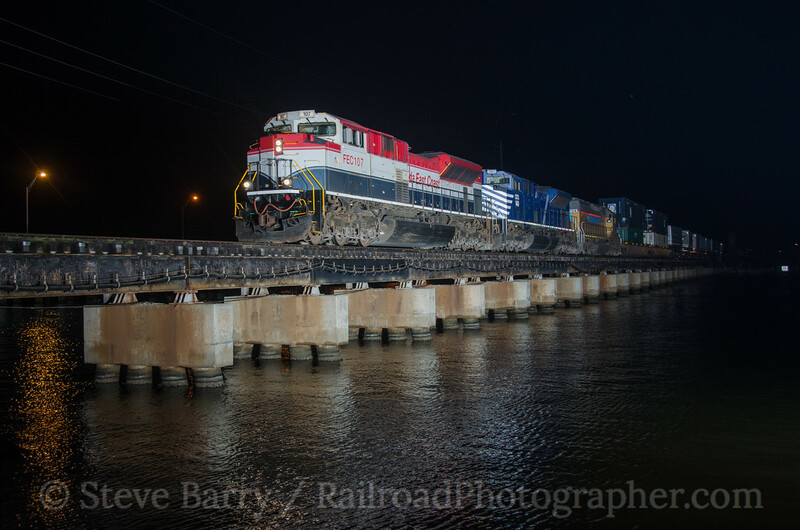 With the red, white and blue locomotive and American flags flying and painted on the tank, it was a patriotic scene! 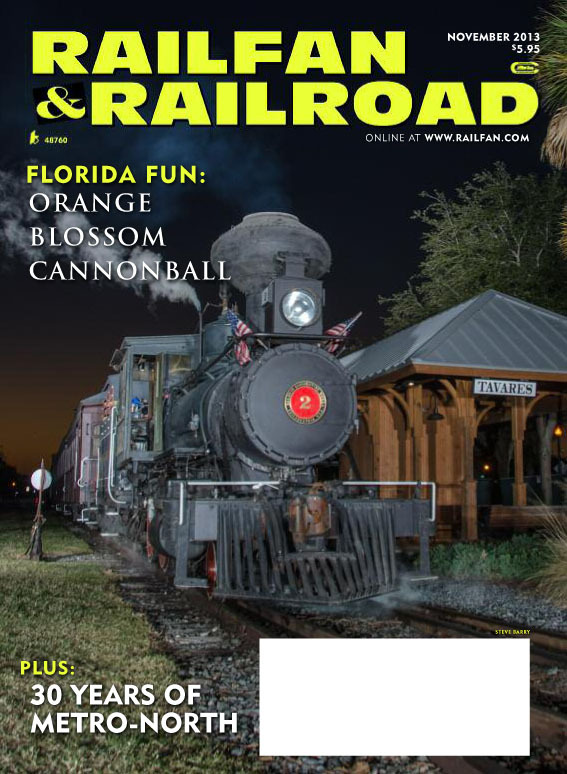 We'll conclude the Florida mini-series next time with a look at Amtrak and some odds and ends. Let's spend a few posts visiting Florida. 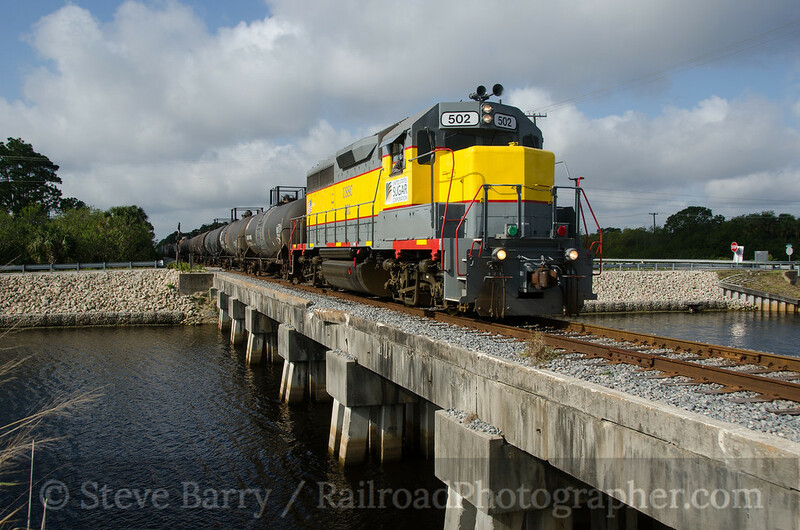 I was down in the Sunshine State for a few days in February, and one of the highlights was visiting the Orange Blossom Cannonball, the passenger train operated by the Tavares, Eustis & Gulf over trackage owned by Florida Central. A group of us arrived on February 9, and we were greeted by Neil Bagaus who showed us around. The new depot in Tavares was nearing completion. We had let the railroad know in advance we were coming (I will be writing a feature on it for Railfan & Railroad this fall) and they arranged for the locomotive to be properly oriented for most of the day. 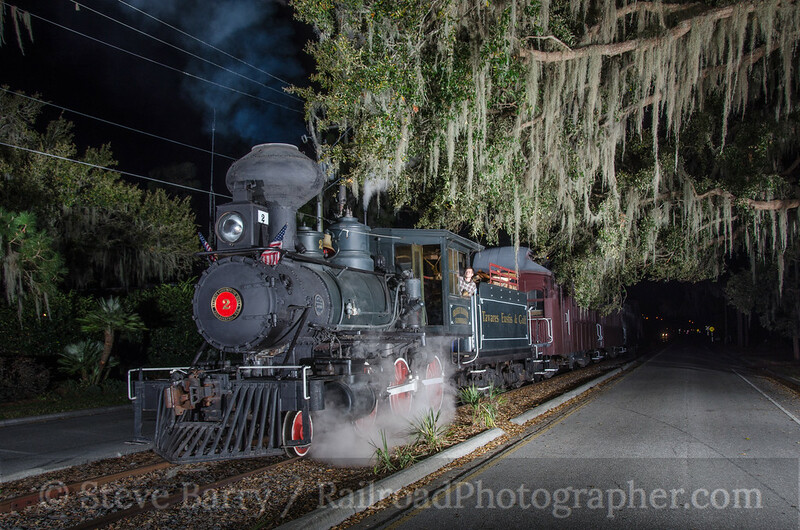 Power for the railroad is a neat wood-burning 2-6-0 built by Baldwin in 1907 for the Lufkin Land & Lumber Company. It went through a variety of owners, but is probably best known for its work on the Reader Railroad in Arkansas. In recent years it has been the star of several movies including 3:10 To Yuma and the remake of True Grit. 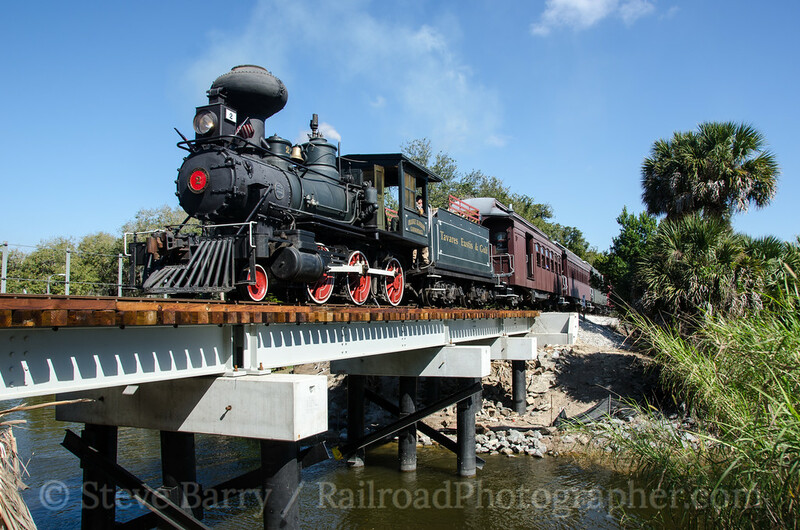 Our day of chasing started out by waiting at the cool timber trestle in Tavares. Okay, it used to be a cool timber trestle; the bridge was replaced about a month before our arrival by a new concrete span that gives more clearance for tour boats and party barges on the canal. Still, the nifty Mogul made a nice sight crossing the bridge. The train makes three trips a day, with short trips to Ellsworth Junction and longer trips to Lake Gem. One thing the railroad does well is entertain people, and during the Lake Gem stop passengers were encouraged to get off the train during the run-around move and watch the switching. A blow-down was also done, with steam spewing from the locomotive to the delight of passengers. When the locomotive ran out of wood between trips, the run to the wood pile was turned into a photo opportunity for riders. It was well done. We shot the train as it made its approach to Lake Gem on the second trip of the day. 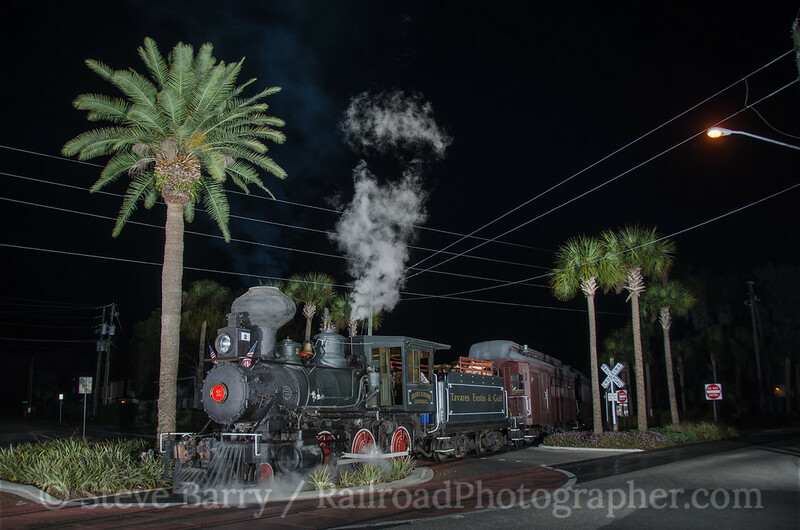 As part of the work for the magazine article, we requested some night photography and the railroad was more than willing to cooperate. There is some street running in Tavares (actually on a median between travel lanes) and we found some nice Spanish moss to frame No. 2. Another night scene involved blocking a traffic circle near the Tavares depot. Neil called the local police, who pretty much said "go ahead and block it." It resulted in a very nice photo. All in all, it was a wonderful day. The railroad was extremely cooperative, and No. 2 is one neat locomotive. As this is being written, No. 2 has one more weekend of work to do this spring before heading back to Arkansas for its federally-mandated 15-year rebuild. It will be back in Florida when the tourist season kicks in again in September. When you make your plans for a winter vacation, be sure to visit this excellent railroad! 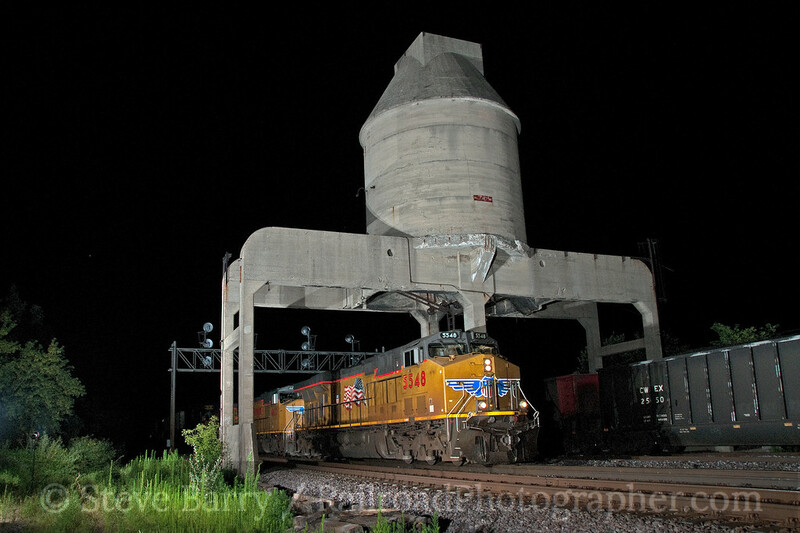 Back in July 2010 I had just purchased four Alien Bees strobes for doing synchronized night photography of moving trains. The Bees arrived just before I headed out from New Jersey to Milwaukee, where I was giving a presentation to the National Model Railroad Association. I had purchased only one battery to power the Bees, which meant I had a ton of extension cords so I could spread the lights around. After working locations in Ohio on the way out, I had dropped down into Illinois on the return trip, heading for the Illinois Railway Museum. One target I wanted to get was the large coaling tower that still straddled the former Chicago & North Western at Nelson. I pulled into Nelson later than I wanted to on July 16, at about 10:00 p.m., and started setting up the strobes. Unfortunately, my extension cords had become hopelessly tangled, and when a westbound train rolled through at about 10:30, I was still trying to get cords straightened out. Not to worry, though -- this is a fairly busy main line and there would be another westbound shortly. Or not. Midnight came and went without any trains at all. I was beginning to think about calling it quits when an eastbound train (the wrong direction) came by. Still thinking about calling it quits, I snapped the last car on the train to get some idea of what my shot would look like if a train came from the proper direction -- and it was really good. Okay, that decides it -- I have to wait it out. Finally at about 2:00 a.m. a westbound finally showed up. Click! Success. While tearing down, an eastbound coal train wandered by. It had a Distributed Power Unit (DPU, a locomotive attached to the back of the train for added power) on the rear. I was well into putting away my lights, but I broke out the tripod and took a going-away shot of the train under the coaling tower. My extension cords misadventures cost me about four hours of sleep that night. Needless to say, I went out and purchased a second battery which, with judicious light placement, has cut down on my extension cord needs by about 80%. Still, the results were worth the lack of sleep. But I still hate cords. Cool Chromes is a semi-regular feature where we look at some slides that have just gone through the scanner. 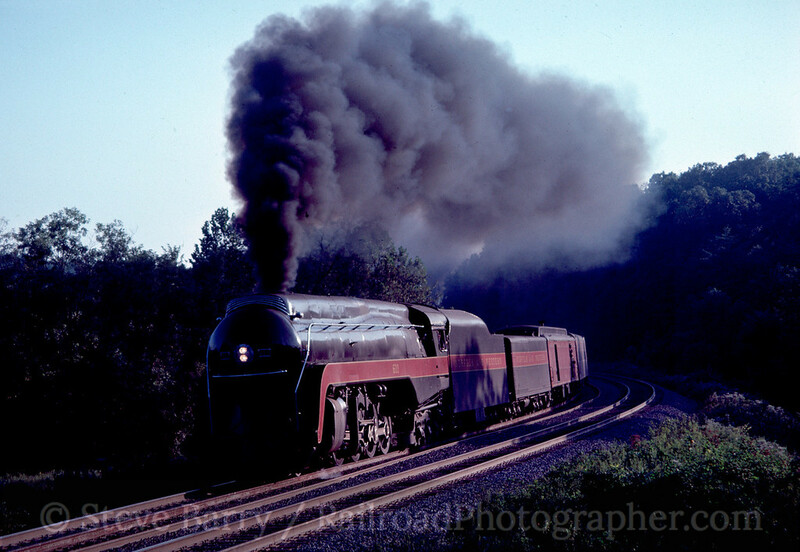 Back when I lived in southern New Jersey, the Southern Railway Steam Specials (and later the Norfolk Southern Steam Specials) came within a one-day trip from the house only on one of their departure points -- Alexandria, Virginia, was three hours down I-95 and trips departed there bound for either Charlottesville or Front Royal. I chased many a trip to both places. 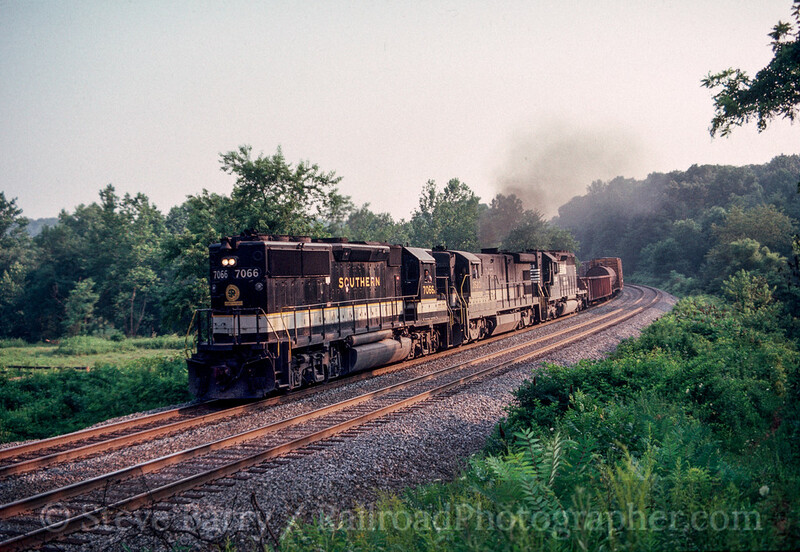 In August 1982 I had chased Southern's ex-Chesapeake & Ohio 2-8-4 No. 2716 to Charlottesville (2716 was a magnificent locomotive, but sadly only served in the Steam Specials for a little more than a year when mechanical issues sidelined in permanently). I knew the locomotive would put on a spectacular show climbing Fairfax Hill on the last leg of its northbound trip, but I didn't know where to go. Marc Balkin of Custom Steam Productions (he was producing audio tapes then; video was still not available) clued me in on a great spot on a curve on the hill. Fairfax Station Road winds its way out of the town of Clifton, and a few miles out of town it turns left at a T intersection before turning right again and heading into Fairfax Station. But turning right at that T put you on Colchester Road, which went under the tracks. At the underpass, there was a good location if you walked up the hill. And it was good. 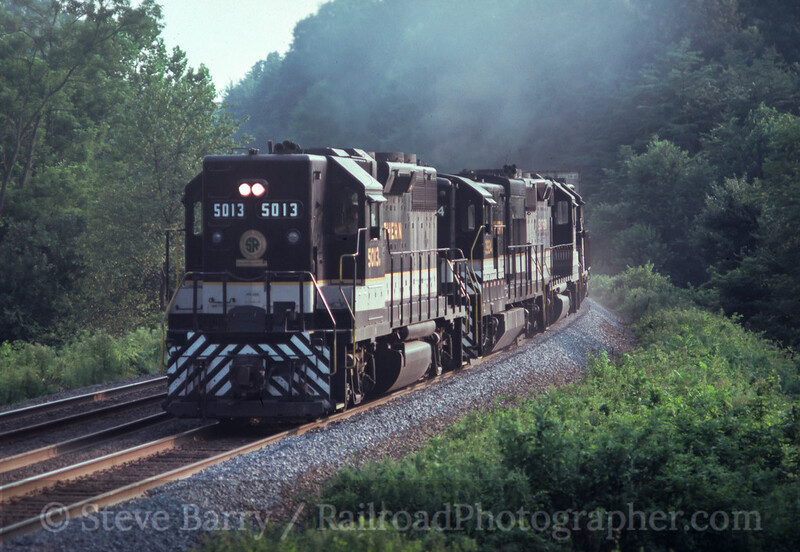 On that first visit in August 1982, a freight train left Manassas ahead of the steam special. 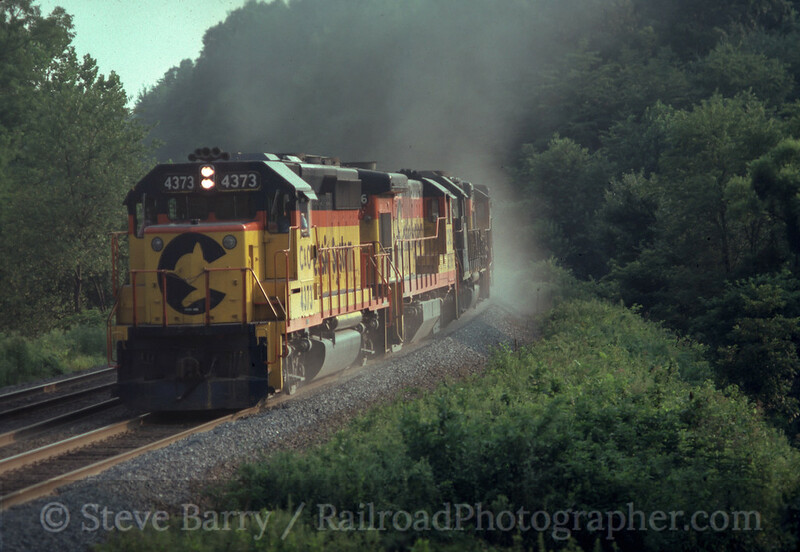 It was a Chessie System freight running on trackage rights over the Southern. A few minutes later, the 2716 came pounding past with the steam special. And as soon as the steam special cleared, another freight could be heard growling up from Manassas, this time led by diesels in Southern's attractive "tuxedo" black and white. If my slide mounts are to be believed (someday I'll pull out the notebooks and verify this), I was back on Fairfax Hill about a month later to witness the newest locomotive in the NS steam program. Norfolk & Western Class J No. 611 came pounding past on this day. 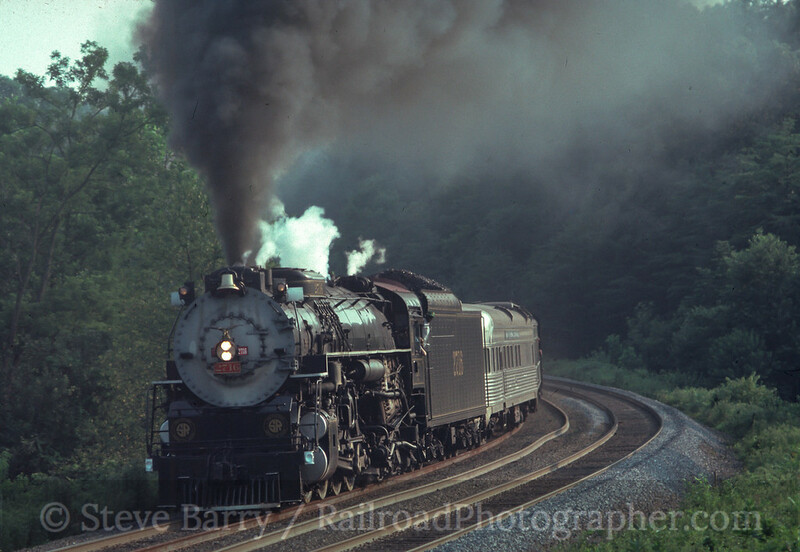 I wouldn't get back to the curve for a steam special for another five years, but in August 1987 (I think -- the date on the Kodak-processed slide mount is pretty much unreadable) I chased Norfolk & Western Y-Class No. 1218 to Front Royal and back. Once again, a freight departed Manassas ahead of the steam special. And despite the Southern's merger into Norfolk Southern over half a decade earlier, this train was led by a pair of units still showing that Southern Serves the South. 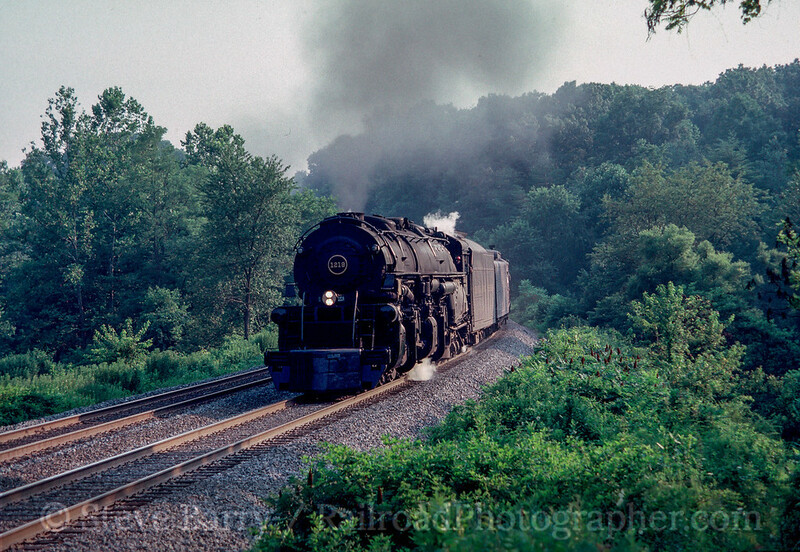 Shortly thereafter, the massive 2-6-6-4 came pounding up the hill. Roll on, eighteen wheeler! With Norfolk Southern operating the new version of the steam specials, Steam In the 21st Century, I'm hoping that eventually trips will be run northward out of Manassas. If they are, I will return to my favorite curve and listen for the whistle at the end of the day.